Preparation is key: In his speech, Kong (right) said that it was important to encourage customers to pre-plan so that they do not make rash decisions. NV Multi Asia made Malaysia proud again by being the only company to win two awards, two times in a row at the Asia Funeral Expo (AFE) 2013 awards ceremony held at the Hong Kong Convention and Exhibition Centre from May 16 to 18. The annual event, held for the second year now, recognises enterprises with the right industry know-how, a well-established corporate portfolio with clear philosophy and vision, as well as those which include sustainable developments into their corporate planning. Last year, Nirvana clinched two accolades namely the Asia Outstanding Brand in Funeral Service Industry and Asia Outstanding Award in Multinational Expansion. The company repeated its feat this year and garnered two awards, the Corporate Social Responsibilities and Marketing Strategy. In his acceptance speech, NV Multi Asia group executive director Jeff Kong said Nirvana prides itself on understanding different cultural needs, being part of a culturally rich country. “This augurs well for our individualised market development. “We deeply understand the philosophy ‘reputation is the livelihood of an organisation’. “Therefore, we are constantly improving our product and service offerings. He added: “The AFE Award serves as a morale booster for Nirvana that will make us grow from strength to strength. “This recognition will help steer us from better to best. The judging panel comprised respected regional experts and representatives from the industry or funeral associations. As for the CSR award, the criteria includes sustainable development, cultural heritage and charitable activities. Kong was proud to receive the CSR award as it served as an acknowledgement of the company’s CSR activities and contributions to society. NV Multi Asia’s Chinese Calligraphy Stone Gallery at the Nirvana Memorial Park in Semenyih was one of the CSR projects as it serves to preserve Chinese heritage and culture. Aside from being a tourist attraction, it can also be a learning place for students of calligraphy or Chinese studies. 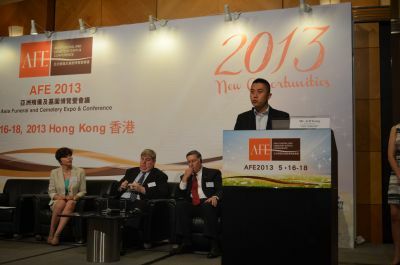 At the AFE conference held earlier in the day, Kong gave a talk on “Direction of Market Expansion”. According to Kong, with their people-first motto, pre-planning is needed as it prevents families from making rash decisions under emotional stress and helps them in coping with the death of a family member. “It is also a way for children to show filial piety to their parents with advance preparation which will help them receive services they want. “Pre-planning ensures that consumers are not affected by inflation, paying todays’s price for a future service,” he said. He also highlighted the importance of environmental conservation. “Green funerals can also change people’s perception of cemeteries from being an eerie place to one that is serene and peaceful. “I believe that industry players can provide high quality service in a beautiful environment while upholding our tradition,” he said. He also discussed the design of cemeteries. “With 23 years of experience in this industry, we understand the people’s needs when it comes to funeral grounds and their facilities and design. “With the increased demand for better quality products and services, industry players must put in more effort and creativity when it comes to cemetery designs,” he said.